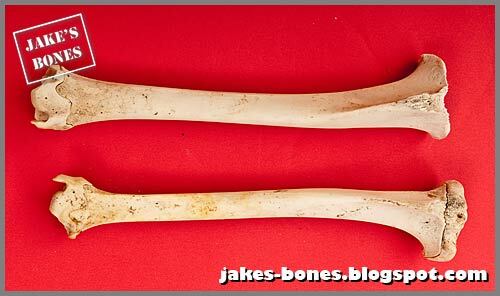 This might look like a boring collection of bones to you, but it shows something quite strange. 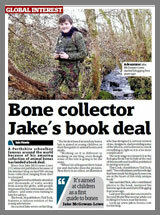 These are bones I have known about for a while. 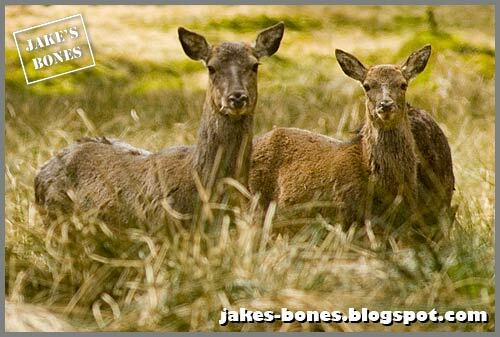 I first wrote about the red deer body in May 2010 (the picture is the big one under "the three dead red deer") and it wasn't until a year later that I noticed something strange about the bones and collected them. I called this collection "Yvette" because it was the 25th set of bones and I name them alphabetically. 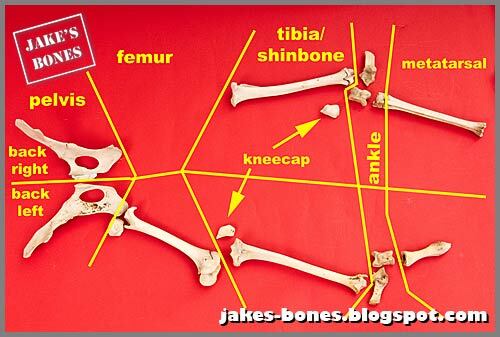 These bones are actually the same as human bones and have the same names, but some are different shapes. The big difference is that they have much longer metatarsals which are the bones in humans which go from the ankle to the the toe knuckle. This is how the bones from the red deer look when laid out. 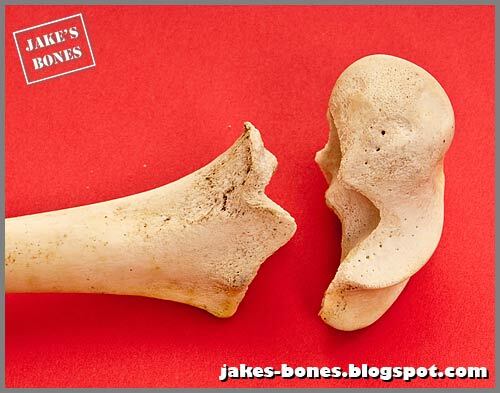 One big difference is that the right femur is missing. It must have been taken away by a fox. It starts normally then it gets thicker with a honeycomb texture, then it tapers off. There are lots of things that might have caused this. It could have been broken off. It could have been chopped off or shot off. But what I think happened is that it was like this from birth. Here are my reasons for thinking this. other broken legs bones I have in my collection are all jagged with sharp edges. 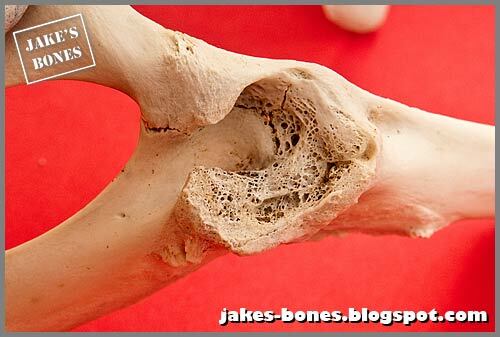 It also feels really light and hollow as if it has never had any weight on it, because bones need to be used and exercised to grow properly. 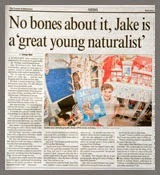 There are other reasons too if you look at the rest of the bones. 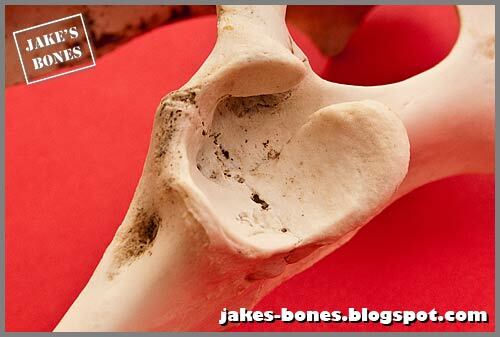 This is the right hip joint, which is a smooth dent that the ball of the femur goes in. But this is the left hip which is filled with bone as if it has never been used. This deer couldn't have moved its left leg much at all. 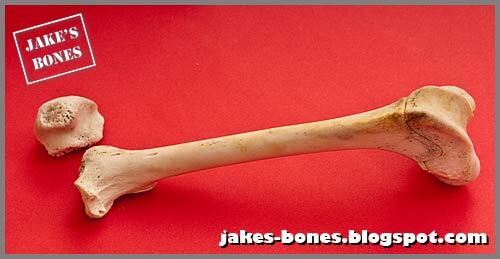 This is the left femur. 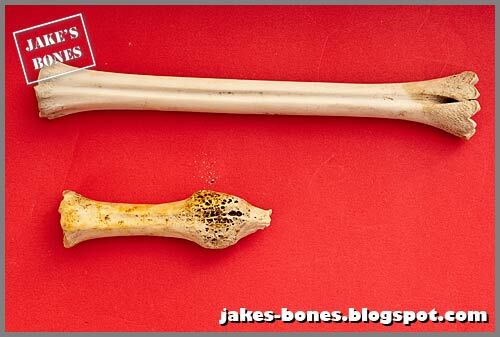 The ball at the top of the femur (on the left) hasn't grown properly. The knee end of the femur is loose. 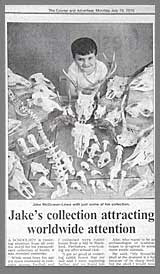 This means the deer was young, maybe less than two years old, and its bones were still growing. These are the two tibias with the right one on the top and the left one at the bottom. The ankle end is on the left and the knee end is on the right. The left one, off the bad leg, is slightly thinner and shorter but it has both ends fused on as if it has finished growing. The right leg, which is normal, hasn't. 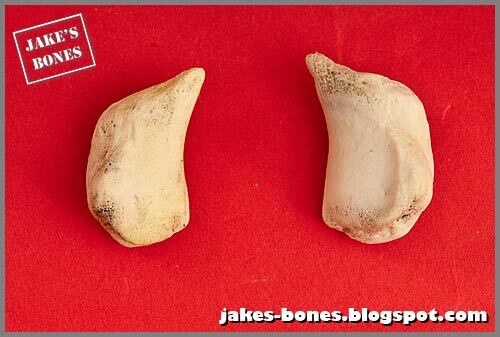 These are the ankle bones, with the left ankle on the left. There isn't much difference between them. These are the kneecaps. I'm not sure which is which. 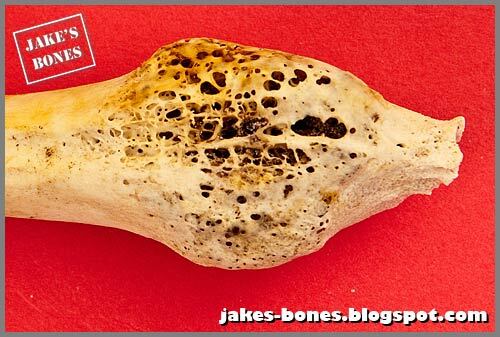 You don't often find these because they don't connect to any other bone. Although all four died, they all must have lived long enough for the bone to heal, or must have lived with just three legs for a bit. 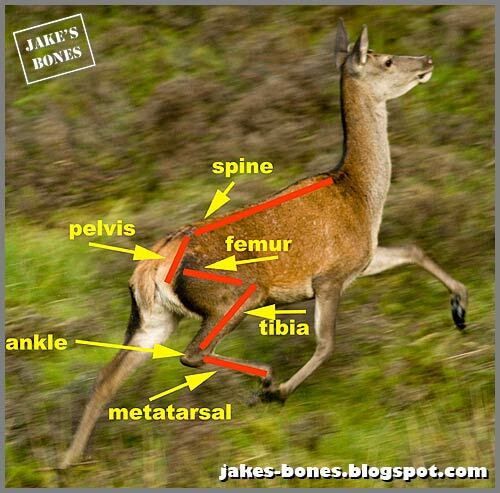 Maybe having three legs isn't so bad after all for a deer. Wow!Now that IS incredibly weird! I'd like to find a deer leg like that. 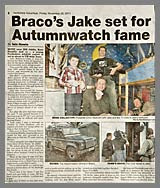 Hi Jake! 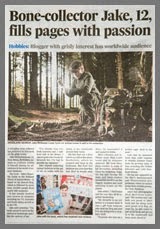 Your site is incredible and your work is most impressive! I teach a bunch of kids around your age and they've recently found a bunch of deer bones near their home. They're from a big city (Seoul) so it's especially exciting for them. So, we need expert advice. I have two questions for you. First, how should we clean them? The flesh is gone, and I saw in one of your posts you said to soak them for a week in peroxide, but do you mean pure peroxide or peroxide plus water? Also, when it's time to rinse them, should I rinse them a while in moving water or let them soak in water for a week? My last question is more of an opinion question. 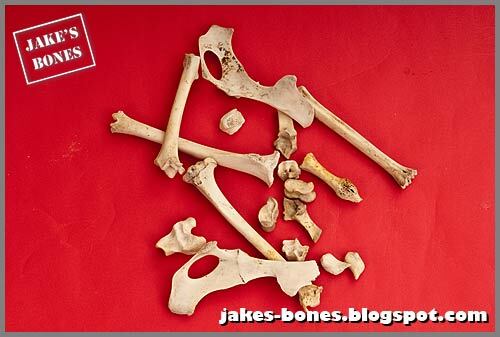 What do you think we should do with the bones when we're done cleaning and investigating? Do you have any cool display or project ideas? 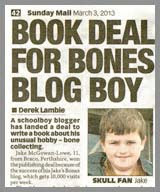 What do you do with your prize bones that aren't complete body parts? PS - if you're curious, we (they) found at least 9 leg bones, a bunch of ribs, hips and shoulder blades, many vertebrae and both lower jaws. 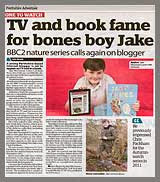 Hi Will - glad you like my website ! The peroxide I use is about 10% or 12% strength. It's best to change the water when you rinse them. Not sure for ideas but I'll have a think about it. 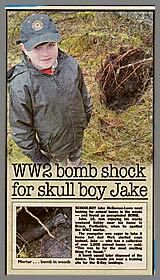 I really enjoy all the forensic detail you put into your posts, Jake. That is such a cool find! My trick for siding kneecaps are to put them on a table with the joint surface downwards. The side they fall to are the lateral (outer) side. Cool tip ! Thanks ! Strange bones #10 - what is this ?